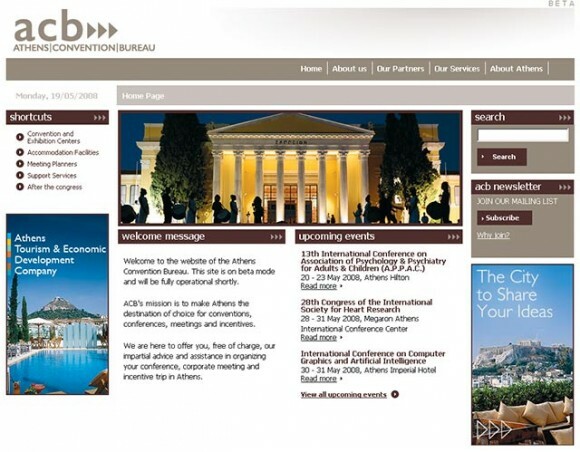 The Athens Convention Bureau (ACB) was officially launched at IMEX travel exhibition (22-24 April) in Frankfurt. ACB’s participation in the exhibition aroused much interest as it has already been included in worldwide conference publications and has launched a pilot website www.athensconventionbureau.gr. During the exhibition, more than 30 meetings were held with hosted buyers from the United States, Canada, France, Britain, Italy, Switzerland, Holland, Germany and India. Many visitors to the exhibition expressed their satisfaction for the creation of an official representative for conventions in Athens. The general consensus of the launch according to ACB representatives -following meetings with hosted buyers but also representatives from other convention bureaus- was that Athens has seen increasing interest for conventions, company events and incentive trips. Athens Convention Bureau, a division of the Athens Tourism & Economic Development Company (ATEDCO), is a member of European Cities Marketing/Conventions Forum and the International Congress and Convention Association (ICCA). According to the bureau, the ACB aims to attract and generate events in Athens and the surrounding area, ensure that Athens is a safe investment for staging meetings and incentives, serve as a link between planners and the local meeting industry and promote Athens as a business events destination. The ACB provides free of charge, impartial advice and assistance in organizing conferences, corporate meetings and incentive trips in Athens. The ACB’s role is only advisory and an aid for the organization of conferences, not a conference organizer in itself.